It has been confirmed that British heavyweight prospects Anthony Joshua and Dillian Whyte will indeed fight later this year, most probably in November or December for the British heavyweight title. Joshua’s promoter Eddie Hearn this week spoke with Whyte once again to hammer out a deal for the contest, with a view to getting the “Villian” out beforehand on his August 1st “Rumble on the Humber” show from Hull. One will suspect this will be added to a larger PPV card, although as Hearn had planned that for his September 12th date, he would surely have to wait for December to ask fans to fork out again? PPV is still a sensitive subject in the UK, although the recent “Rule Britannia” triple world title show from London went some way to softening the blow for people, following last November’s Bellew/Cleverly 2 disaster. 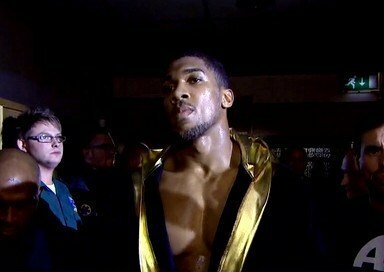 PPV or not, at last the fans will see what they wanted, and that is opponents in the opposite corner capable of standing in front of Joshua without being instantly blown away. One must hope for Whyte’s sake he is given a decent warm-up test on 1st August and is given a fight he can learn a little something from in preparation. It’ll be a delicate piece of matchmaking. Two undefeated (heavyweight) prospects matched together at this stage of their careers. You don’t see that nearly often enough in boxing. I don’t say it much – but bravo, Eddie Hearn. You are here: Home / Boxing News / Anthony Joshua v Dillian Whyte Is On!